Zhang Zhao's hand limit is always his maximum health. 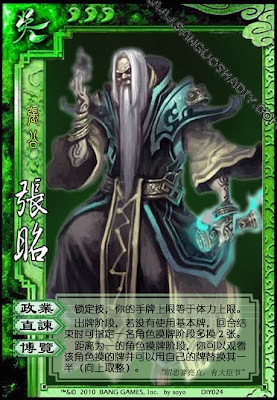 If Zhang Zhao does not use any basic cards during his turn, he can select any player. That player then draws two more cards during their drawing phase. If a player is one distance away from Zhang Zhao, he can look at the cards that player draws. He can then exchange up to half, rounded up, of these cards for his hand cards. When Zhang Zhao selects a player with "Frank Instruction" and they are starved, they do no draw anything. A +1 horse thwarts Zhang Zhao's "Point of View".